I walked into viewing season 1 of Veronica Mars with very little background on the show. Outside of knowing that it was a UPN/CW show, that it starred Kristen Bell, and that it seemed to have a pretty solid Internet following, I had nothing on the show. (I believe, “Is that the show where she has psychic powers to solve mysteries?” was uttered in response to my wading into the first season [note: it is not].) The curiosity thanks to the Internet fandom was enough to prompt me to fire up the series and see what the clamor was all about. I think the best way I can describe Veronica Mars to someone is to say: if Twin Peaks and Brick had a baby, and that baby eventually went to Sunnydale High, it would be Veronica Mars. Twin Peaks comes from the first season’s overarching Who Killed Lilly Kane? angle, complete with townsfolk with more going on behind the picket white fences (or the iron estate gates, as it were). Brick because of the show’s well-defined social structure, with each group and status playing off of the other quite intelligently in a noir setting. And Sunnydale High because it looks like Veronica is going to the same school that Buffy went to. I suppose an even better way to describe the show is: it’s good. 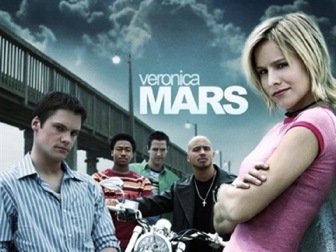 Veronica Mars is a noir set in Neptune California, where Veronica (Kristen Bell) is a private investigator/high school student, working with her father, Keith Mars, (Enrico Colantoni), the disgraced ex-Sheriff of Neptune who runs his PI business and raises Veronica on his own after his wife (her mother) runs out on the family. Why did she run out? How does that tie into Keith Mars’s botched attempt to solve the Lilly Kane murder? And was it actually botched? This is the overarching mystery that unfolds through season 1 of the series, bookending each episode’s “Case of the Week” approach to storytelling. Those cases are sometimes interesting, like “The Wrath of Con” where Veronica needs to snoop out a money fraud scandal akin to those e-mails from Nigerian princes, or “Clash of the Tritons” which has some of my favorite lines from the season, but are usually what you get through to get to the nuggets for the overarching mystery (in this sense, it is very much like watching a season of The X-Files in that the mystery of the week is sometimes cool and sometimes not, but the nuggets of the growing mythology keep us coming back). But even in those cases, Veronica Mars does an excellent job of deepening our understanding of the characters’ stories, which lets us forgive some of the more outlandish aspects of the series (sure, the ATF would totally ask Veronica for help to ferret out a bomb threat suspect), and also helps us try to puzzle out the solution to who killed Lilly Kane. The more we learn about the characters, the more fun we have trying to hold everyone to the light. Those characters are interesting because they serve the stories well. Indeed, the characters are broad arche(or stereo)types, set up for the audience to see the social classes Veronica is working with and against. As the season moves on, we learn more about their backstories, but it always seems to be in service of the plot, not necessarily of the characters themselves. But, as I mentioned before, it’s that development that keeps the episodes interesting. Some of the acting is pretty wooden and doesn’t look out of place for a UPN and then The CW show, with the pretty/handsome early-twentysomethings-playing-teenagers standard we’ve all come to know and love (not to mention great guest stars, like most of the child-cast of Home Improvement and Harry friggin’ Hamlin!). But really, honestly, this isn’t a detriment, and the writing is sharp, so even as stereotypes, they’re interesting. There are two exceptions to this generic CW actor/acting rule and they are Kristin Bell and Enrico Colantoni. In order for the show to work, Veronica has to work, and honestly, Bell has the character down pat. Veronica is defensively snarky, she’s smart, and a bulldog. Bell plays these parts pitch perfectly, and suddenly it’s forgivable that most of the other actors on the show are pretty broad and cookie cutter because Bell sells Veronica’s view so well, we’re seeing the people she interacts with the way she sees them. And her relationship with her father, who starts off as her only support network in a place that actively hates her, is spot on, thanks in large part to Colantoni’s performance as the shamed Sheriff-turned-PI. Those two performances and very sharp writing are the keystones to Veronica Mars’s success. After tearing through season 1 of the series (twenty two 42-minute episodes in 1 week), I get the draw of the series. Veronica Mars is funny, dark, a nicely balanced noir, and playfully smart. It’s good television and like so many shows before it, appears to have been cancelled before its time. But for now, it’s new to me and I’m already eager to dig into season 2.